TAILBOARD FIELD CAMERA. 1880s. Arthur L. Adams, founded 1884-1886, 24 Charing Cross Road, London WC., were noted for cameras of the very highest quality (and price!). 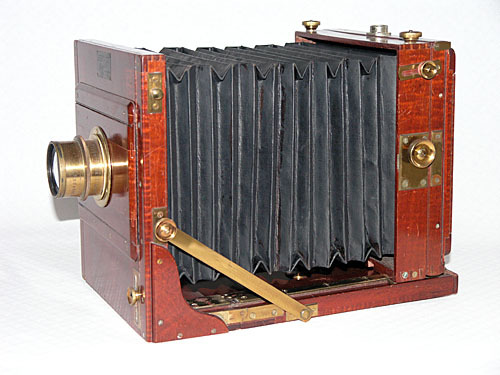 The 'Challenge' model, made from an expensive cut of figured mahogany, known as 'Fiddleback Mahogany', came in two varieties, long and short focus, identical apart from the length of bellows extension. I have catalogued this one as 'short focus' because it came to me without any bellows at all, and I fitted short bellows as they were all I had to hand. With its new bellows it can easily still achieve double extension. 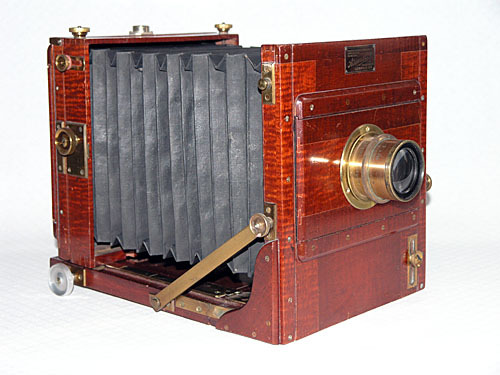 Lizars of Glasgow also produced a line of 'Challenge' cameras.